I have been doing research on banking for some time. Much of this research is on “runs on banking systems” which also are called “banking panics.” More recently I have been working on financial crises, partly because of the financial turmoil that started in the middle of 2007 and came to a head as a crisis in September and October 2008. Runs on banks or similar institutions such as money market funds are a long-standing problem, going back at least to medieval times and probably back to ancient Greece and Rome. My research emphasizes runs on banking systems and responses to those runs, with much of the research based on nineteenth-century U.S. experience. That said, knowledge of those earlier events made it obvious that runs on money market funds were bound to happen. The Financial Crisis of 2007 to 201? I’ve given many talks to economists and non-economists about the Financial Crisis of 2007 and 2008, in the United States and in Europe including at the Bank of Greece. The banking crisis of 20007-2008 turned into a sovereign-debt crisis in the eurozone. In fact, I call it the “Financial Crisis of 2007-201?”. If discussions in Europe are to be believed, it may become known as the “Financial Crisis of 2007-2013”. I am dubious. The Financial Crisis of 2007-201? is my general summary of the financial crisis from 2007 to 201?. This was written in May 2012 and the discussion assumes some familiarity with financial markets. I did a taped interview at the University of Francisco Marroquin a while ago now. The interviews are up on YouTube. The first interview on YouTube is about how it all began and the roles of the U.S. government sponsored enterprises and a relatively small amount of securities tied to subprime mortgages. In the second part of the interview on YouTube, I talk about financial innovation and why it is important for economic growth and the well being of people around the world. I also have appeared on television in the U.S. and Ireland. The trigger for the financial crisis was housing, and difficulties spread due to securities known as Collateralized Debt Obligations (CDOs). My paper with Paula Tkac on the crisis itself, “The financial crisis of 2008 in fixed income markets” highlights the role of these securities due to the difficulties valuing them. This paper was published in the Journal of International Money and Finance. The versions available here are the working-paper versions because the published papers are copyrighted. Paula and I wrote a subsequent paper on CDOs, “The financial crisis of 2008 and subprime securities”. This paper was published in “Financial contagion: The viral threat to the wealth of nations”. A related paper examines the link, or lack thereof, between the financial crisis and financial innovation. Many think the financial crisis was due to financial innovation. I doubt that. Some financial innovations made the crisis worse, but the underlying causes were there without financial innovation. The reasons for my doubt are outlined in “Financial Innovation and the Financial Crisis of 2007-2008”. This paper was translated into Spanish for publication in Papeles de Economãa Espaoñla. The long-lived fall in real income (GDP) and the growth rate since 2007 raises an interesting question: Are financial crises associated with long and persistent recessions? The short answer: Little evidence points in that direction. James Lothian and I examined this question in an online post and in a related journal article for the United States since 1870. John Devereux, Scott Baier, Robert Tamura and I examined the question for 21 countries around the world from 1870 (or 1900 for a few) to 2009. We find huge differences in the sizes and durations of recessions. It definitely is not the case that banking crises invariably are associated with deep and long recessions. Sometimes they are; sometimes not. Why? John Devereux and I are working on that. An important part of the financial crisis was the run on money market funds, which happened the same week as the failure of Lehman Brothers and the Fed bailout of AIG. Why did people run on the money market funds, in particular the money market funds that held commercial paper? For the same reason people have run on banks probably since ancient Greece or Rome: people were worried that the funds would not be able to honor the promise to pay $1 for each dollar invested. Why do money market funds and banks promise to pay the face value, or par value, of their liabilities on demand? It is all but certain that they will not be able to honor this promise at some unknown future date. To my mind, this most basic question about banking is a simple question. Banks promise to give you a dollar whenever you want in exchange for your giving them a dollar. Banks keep fractional reserves, which means that they inevitably cannot honor this promise at some point. If enough people want currency at one time, the bank runs out of currency. Sooner or later, enough people come to the bank at one time that the bank cannot honor the promise. The problem for money market funds really is no different than for banks. If banks or money market funds didn’t make this promise, bank runs (called banking panics in the literature) would be impossible. Yet, banks make this promise. Why? Margarita Samartín and I summarize the theories and provide some evidence from historical banking in “Why Do Bank Promise To Pay Par On Demand?”. The history suggests that all of the theories are informative about some of the history but no one theory is informative about all of banking history. None of the theories explains why money market funds operate to keep their net asset value at a dollar. Our analysis does show that money market funds are subject to runs in the same way that banks are given the way they operate right now. Each of the theories examined in the paper explains some historical banking arrangements, but none explains current U.S. money market funds. Curious, isn’t it? This paper is published in the Journal of Financial Stability. Unfortunately, this paper was prescient about money market funds. The analysis in “Why Do Bank Promise To Pay Par On Demand?” answers why money market funds made themselves vulnerable to a run. Short answer: their customers prefer to have their funds available on demand without worrying about the current market value of assets. It’s easy to state this preference; it is not so easy to make such a preference comprehensible in a coherent economic theory. No one has done it to date. Today’s money market funds in the U.S. also provide an excellent example suggesting that electronic money as part of some other monetary system is likely to be redeemable at par. Our analysis also indicates a key aspect of such electronic money; it is necessary to be concerned about runs, either how to avoid them or how to deal with them. Unlike deposits and similar to fiat monies, Bitcoin operates without a fixed value in terms of anything else. This fluctating value means that it is not subject to runs as bank deposits are. It is not likely, though, to survive as a casually or frequently used part of another monetary standard given the history of bank deposits and similar forms of money. Only time will tell whether Bitcoin will be successful. My paper on Bitcoin and similar currencies concludes that such digital currencies do not have any fatal flaw that will kill them. There is a lot of history about bank runs. I have done some research on them, trying to sort it out. Banks fail in runs. Why? It is easy to say after the fact that banks failed in runs because they were risky, but it may not have been obvious before hand. Rik Hafer and I examine bank runs in the United States' free banking period to see whether banks that appear risky before the runs are more likely to fail. We find that banks failing in a panic did appear riskier by general financial criteria before the run. This is an occasion when the conventional wisdom at the time is correct. This paper, “Bank Failures in Banking Panics: Risky Banks or Road Kill?”, was published in Bank and Financial Market Efficiency: Global Perspectives, volume 5, Research in Banking and Finance, edited by Iftekhar Hasan and William C. Hunter, pp. 47-70. Amsterdam: Elsevier Ltd., 2004. Runs on the state banking systems occurred in the free banking period. Iftekhar Hasan and I document the existence and some implications of bank runs in “Bank Runs in the Free Banking Period.” Journal of Money, Credit, and Banking 26 (May 1994), 271-88. You may be able to access this online. You can get a copy at many libraries or from me. A suspension of payments is one way to deal with a bank run: in short, a bank or set of banks just quits paying out. This is what the fund that “broke the buck” in October 2008 did, but other funds did not do so. Such a joint action is called a “suspension of payments”. Iftekhar Hasan and I provide evidence on the effects of suspensions of payments in “Suspensions of Payments, Bank Failures and the Nonbank Publics’ Losses”. Our evidence indicates that, if banks are allowed to just quit paying out, fewer banks fail in the end and the final losses to noteholders are less. This paper was published in the Journal of Monetary Economics in 2007. The data on bank failures, losses and related variables are available by sending an e-mail to me. The primary assets held by these banks were state and federal bonds and changes in the prices of these bonds were important for the banks. Rik Hafer, Warren Weber and I published a paper that collected these data together. “Weekly U.S. and State Bond Prices.” Historical Methods 32 (Winter 1999), 37-42. You can get a copy of this paper at many libraries or from me. All of the data we used in the paper are available in an Excel spreadsheet. If you’d like the additional available data on Illinois and New York, there is another Excel spreadsheet which includes those data. My paper “Wildcat Banking, Banking Panics and Free Banking in the United States” Federal Reserve Bank of Atlanta Economic Review 81 (December 1996), 1-20 summarizes much of what is known about banking and bank runs in the free banking period in the United States. 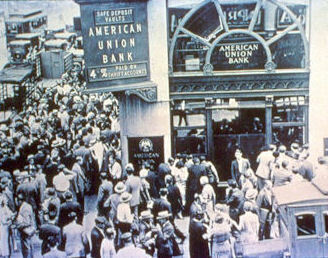 The free banking period is informative partly because it is supposed to be an era of wildcat banking when banks were organized where the wildcats roamed. This paper disspells that notion but shows the little bit of truth in it. Private — non–governmental — remedies developed for bank runs. R. Alton Gilbert and I focus on private remedies for bank runs in the National Banking period in “Bank Runs and Private Remedies” Federal Reserve Bank of St. Louis Review 71 (May/June 1989), 43-61. All material copyright Gerald P. Dwyer, Jr., 1999-2014.